Globally, energy systems are experiencing unprecedented change, driven by a blend of technological innovation, changes in supply dynamics, consumption patterns and policy shifts. Innovations in energy technology have reduced costs, created jobs and supported the reduction of CO2 emissions from the energy sector. The electricity system is changing, driven by decentralization, electrification and digitalization.12 Growing decentralized sources offer an alternative to the current grid to deliver power. This is particularly relevant as access to energy increases in remote locations currently outside of the grid.13 Electrification is critical for long-term carbon reduction goals14 and technology innovations allow a greater electrification of transport and heating today.15 The convergence of these trends reinforces and amplifies their individual contributions. For example, the combination of decentralized sources and digitalization has allowed traditional consumers to change their role in the energy system.16 These changes have already impacted the business model in the electricity sector and are playing an important role in the decisions electric utilities are making for the future. Energy consumption patterns have fundamentally shifted in the last years, resulting in new demand dynamics. Policy-makers have started to adapt energy policies, and new coalitions have been formed to address challenges and harness opportunities associated with these developments. Countries can use these game-changing trends to enhance their energy systems and improve the well-being of their populations. Understanding the urgency and implications of these trends is critical to businesses, governments and society as a whole. In many cases, responding to them will require fundamental shifts in how businesses are run, policies are set, household choices are made and stakeholders collaborate with one another. Box 1: What is the energy system? Energy systems are complex and at the heart of every country’s economy. They comprise diverse stakeholders, various energy sources and all energy-consuming sectors, including industry, buildings and transport. Energy systems aim to support society in the three dimensions of the energy triangle: 1) inclusive, economic development; 2) environmental sustainability; 3) secure and reliable access to energy. 7 Savings of $290-390 million in yearly productivity improvements in the oil and gas and mining industry, $310-540 million in energy efficiency savings and $150-280 million in transportation efficiency savings; see “How technology is reshaping supply and demand for natural resources”, McKinsey Global Institute, February 2017, available at https://www.mckinsey.com/business-functions/sustainability-and-resource-productivity/our-insights/how-technology-is-reshaping-supply-and-demand-for-natural-resources. 8 International Renewable Energy Agency (IRENA); McKinsey; The cost of wind, solar and storage technology between 2010 and 2016 reduced by approximately 30%, 70% and 75%, respectively. 9 International Renewable Energy Agency (IRENA), Renewable Energy and Jobs: Annual Review 2017, available at https://www.irena.org/DocumentDownloads/Publications/IRENA_RE_Jobs_Annual_Review_2017.pdf. 10 U.S. Energy Information Administration, “Henry Hub Natural Gas Spot Price” (dollars per million BTU), 2010-2016, available at https://www.eia.gov/dnav/ng/hist/rngwhhdA.htm. 11 Share of electricity net production from coal in the United States declined from 45% to 30% while net production from natural gas increased from 24% to 34%; U.S. Energy Information Administration, “Net generation for United States, monthly, 2002-2016, available at https://www.eia.gov/electricity/data/browser/#/topic/0?agg=2. 12 See also the World Economic Forum report, The Future of Electricity: New Technologies Transforming the Grid Edge, available at http://www.weforum.org/reports/the-future-of-electricity-new-technologies-transforming-the-grid-edge. 13 Bloomberg New Energy Finance; by 2015, more than 20 million pico solar products had been sold to off-grid consumers, providing basic energy access to people otherwise disconnected to clean and affordable energy. 14 In combination with the decarbonization of the electricity generation mix. 15 In the United States alone, a combination of policy changes (e.g. BEV subsidies, tax incentives) and shifting consumer preferences resulted in sales of 160,000 electric vehicles; McKinsey, “Dynamics in the global electric-vehicle market”, July 2017, available at https://www.mckinsey.com/industries/automotive-and-assembly/our-insights/dynamics-in-the-global-electric-vehicle-market#0. 16 Australia can serve as an example for the rise of the “prosumer”, where more than 20% of households produce their own electricity through rooftop PV installations and use new digital technologies to reverse the flow of electrons and sell back to the grid; RenewEconomy, “One-quarter of Australian homes now have solar”, available at http://reneweconomy.com.au/one-quarter-of-australian-homes-now-have-solar-70886/. 17 BP, “BP Statistical Review of World Energy”, June 2017, available at https://www.bp.com/content/dam/bp/en/corporate/pdf/energy-economics/statistical-review-2017/bp-statistical-review-of-world-energy-2017-full-report.pdf. 18 International Energy Agency, Energy Efficiency 2017, available at https://www.iea.org/publications/freepublications/publication/Energy_Efficiency_2017.pdf. 19 NBCNews, “(Incandescent) lights to go out in China”, November 2011, available at http://www.nbcnews.com/id/45166535/ns/world_news-asia_pacific/t/incandescent-lights-go-out-china/#.WeEUOFuPKMI. 20 United Nations Framework Convention on Climate Change (UNFCCC), “UN Climate Change”, available at http://newsroom.unfccc.int/about; 166 countries ratified the treaty. Syria and Nicaragua did not sign the agreement, and the United States announced their intention to leave the agreement in 2020. 21 India cancelled plans to build 14 GW of new coal generation capacity; CleanTechnica, “India Cancels Nearly 14 Gigawatts Of Proposed Coal Plants”, May 2017, available at https://cleantechnica.com/2017/05/25/india-cancels-nearly-14-gw-proposed-coal-plants/. 22 In January 2017, China’s National Energy Administration announced it is cancelling the construction of 85 coal-fired power plants and will invest $350 billion in renewable energy sources; Independent, “China scraps construction of 85 planned coal power plants”, January 2017, available at http://www.independent.co.uk/news/world/asia/china-scraps-construction-85-coal-power-plants-renewable-energy-national-energy-administration-paris-a7530571.html. 23 The New York Times, “Britain to Ban New Diesel and Gas Cars by 2040”, July 2017, available at https://www.nytimes.com/2017/07/26/world/europe/uk-diesel-petrol-emissions.html. 24 International Energy Agency, World Energy Investment 2017 report, available at https://www.iea.org/publications/wei2017/. 25 Sustainable Energy for All, available at http://www.se4all.org/; Global LEAP, available at http://globalleap.org/. 26 RE100, see http://there100.org/; ICLEI – Local Governments for Sustainability (International Council for Local Environmental Initiatives), “100% Renewable Energy Cities & Regions Network”, available at http://www.iclei.org/activities/agendas/low-carbon-city/iclei-100re-cities-regions-network.html; Renewable Energy Buyers Alliance (REBA), available at http://rebuyers.org/. 27 EP100, see http://www.theclimategroup.org/project/ep100; Alliance to Save Energy, Energy Productivity Playbook, available at http://www.ase.org/sites/ase.org/files/gaep_playbook-energy-productivity_alliance-to-save-energy.pdf. 28 Global Tracking Framework, see http://gtf.esmap.org/. 29 In Europe, the Roadmap 2050 project evaluates the continent’s readiness for transition, the near- and long-term prioritization of key actions, and the technical, economic and policy implications. For a general overview of policy on sustainable energy regulation, see World Bank, Regulatory Indicators for Sustainable Energy: A Global Scorecard for Policy Makers, 2016, available at http://documents.worldbank.org/curated/en/538181487106403375/pdf/112828-REVISED-PUBLIC-RISE-2016-Report.pdf. 30 European Climate Foundation, Roadmap 2050, available at http://www.roadmap2050.eu/attachments/les/Volume1_ExecutiveSummary.pdf. 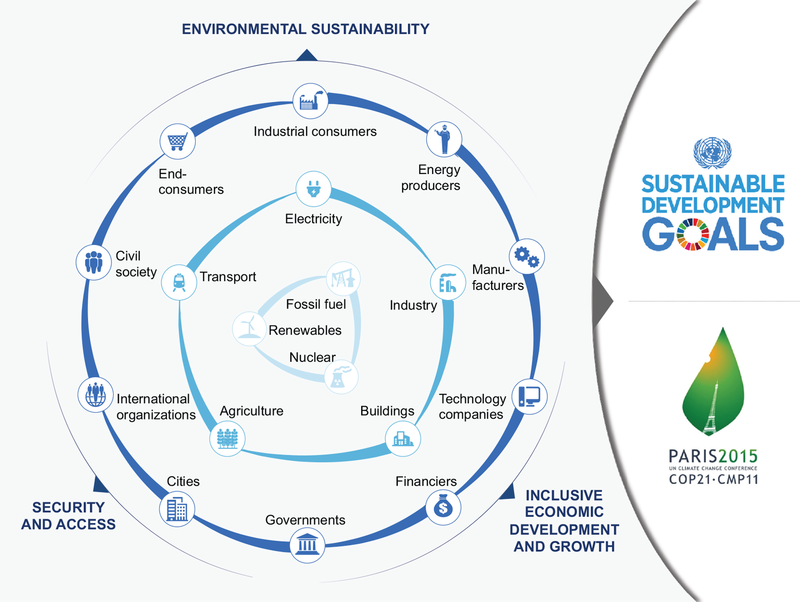 31 United Nations Sustainable Development Goals, “Goal 7: Affordable and clean energy”, available at http://www.un.org/sustainabledevelopment/energy/ and http://www.un.org/sustainabledevelopment/wp-content/uploads/2016/08/7_Why-it-Matters_Goal-7_CleanEnergy_2p.pdf. 32 World Bank, Doing Business 2017: Equal Opportunity for All, 2017, available at http://www.doingbusiness.org/~/media/WBG/DoingBusiness/Documents/Annual-Reports/English/DB17-Report.pdf. 33 World Bank, “Affordable and clean energy”, available at http://datatopics.worldbank.org/sdgatlas/SDG-07-affordable-and-clean-energy.html. 34 Stern, N., Stern Review on the Economics of Climate Change, Summary of Conclusions, HM Treasury, 2006.